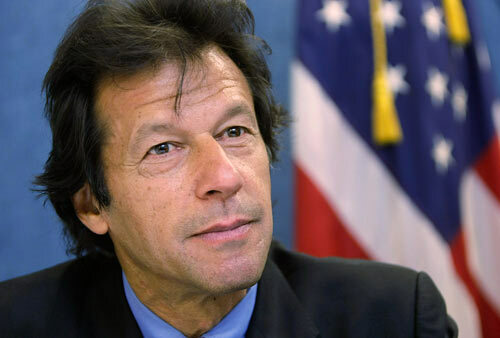 Imran Khan Brings Anti-Musharraf Effort to U.S. A former cricket star who leads one of Pakistan's minority parties spent time in Washington this week meeting with lawmakers and speaking out against U.S. support of Pakistani President Pervez Musharraf. Imran Khan Brings Anti-Musharraf Effort to U.S.
Imran Khan holds a briefing at the National Press Club in Washington, Jan. 24, 2008. A former cricket star who leads one of Pakistan's minority parties spent time in Washington this week meeting with lawmakers and speaking out against U.S. support of Pakistani President Pervez Musharraf. Imran Khan, an international celebrity since his days as a sports star, leads a much smaller party than that of Benazir Bhutto, the leader who was killed last month. But in Pakistan, he's nearly as well known as Bhutto. And he says that next month's elections there won't be real, if they happen at all. Musharraf removed the independent judges who would referee them. Yet Khan knows the president remains a U.S. ally in the war on terrorism. "Gen. Musharraf has done a brilliant PR job here where he has convinced the people that he is one man holding these hordes of terrorists, the bastion against these extremists...." Khan says. In an effort to change that image of Musharraf, Khan met this week with U.S. congressional leaders and spoke before audiences at a Washington think tank, the Center for Strategic and International Studies, and at the National Press Club. Asked by a TV reporter whether he would accept a power-sharing agreement with Musharraf, Khan replies, "Absolutely not." In an interview with NPR, Khan says "across the spectrum, from the right to the left, [Pakistanis] want Musharraf to go .... The U.S. administration must be getting this information. In Pakistan, according to all the polls, [U.S. officials] are backing someone who is deeply unpopular in the country." Asked if the U.S. has enough influence to cause — or prevent — a change in Pakistan's government, Khan says: "Well, at the moment, the only backer of Gen. Musharraf is the U.S. government. The army is only backing him now because they think that the U.S. government backs Musharraf." Last year, Musharraf purged the Pakistani supreme court of independent judges. 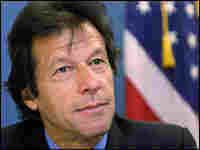 Khan says his party wants the U.S. to "insist on the reinstatement of the constitutional judges of Pakistan. That's all we want. And once that happens, then the constitution will take its course." Khan's party and other Musharraf opponents have vowed to boycott the upcoming elections in Pakistan until the judges are reinstated. "Sooner or later, we will have to have free and fair elections," Khan says. "Any government coming out of these fraudulent elections is not going to last long."